FILE - A man rides a motorcycle past the Cambodia National Rescue Party (CNRP) headquarters in Phnom Penh, Nov. 17, 2017. A Cambodian court on Tuesday ordered the temporary seizure of the headquarters of the main opposition party, pending the payment of damages to Prime Minister Hun Sen, the latest blow to the dissolved opposition Cambodia National Rescue Party (CNRP). 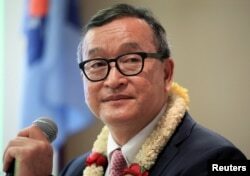 FILE - Sam Rainsy delivers a speech to members of the Cambodia National Rescue Party (CNRP) at a hotel in metro Manila, Philippines, June 29, 2016. "In order to defend the benefits of creditors in this case by law and guarantee the effective legal enforcement, the court should seize the property temporarily," Ros Piseth said.